I have a weakness for all things British. It has been like this ever since I was informed at the age of twelve that my maternal great-grandfather's family emigrated from London. That changed everything. After that I suddenly preferred my tea with milk, I insisted that we buy crumpets from the supermarket, and informed most everyone who would listen that I was going to Oxford for law school. I had a wild imagination. Luckily, I also had a grand-mum who entertained my nonsense without much of a thought. I'd like to tell you that these strange affinities have dwindled with age, but in fact they haven't. Two Fat Ladies, Rosemary & Thyme, and all sorts of things I should not have an interest in for another forty to fifty years really make me happy. 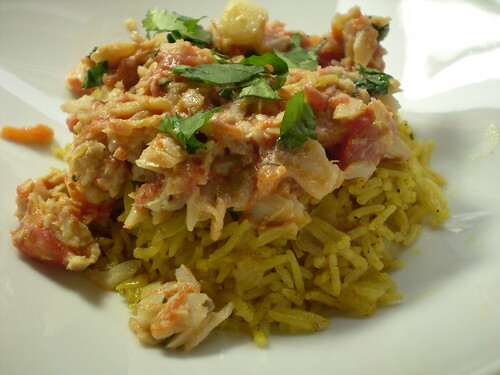 So, when I bought one of my first cookbooks after college, I quickly took note of a recipe called Kedgeree, which was described as an Anglo-Indian inspired brunch dish. This wasn't a dish I'd ever heard of or seen in a restaurant. If I was to get back to my "roots" as a proud Union Jack waiving citizen, I needed to know more. I have learned there are as many variations on this dish as there were colonies in the British Empire at the turn of the last century. Yet almost all them require some sort of smoked fish as the main ingredient. Now, I'm no stranger to smoked fish having grown up in New York, but eating lox on a bagel is a very different experience. 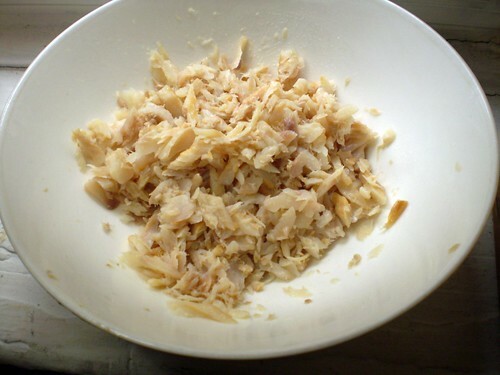 As a kid, there were other types of smoked fish that appeared on the brunch table when we had company over, but they were things I thought only the old people ate (read - relatives visiting from Florida). Smoked sable, chubbs, and whitefish were foods I didn't dare try back then. Things have changed a bit, and today there are hardly any fish I dislike, so when I saw this beautiful locally caught smoked trout in the market, I was excited. But, come Sunday morning when I found myself skinning and deboning this trout for my first meal of the day, hands covered with fish grease and pin bones multiplying every time I looked down, I suddenly felt more like a pain au chocolat than Kedgeree. It is a good thing it took me all these years to try this dish, having stored it away in the back of my mind. I am much less squeemish than I used to be, so although the fish preparation was messy and a bit of a pain in the arse, I managed to make it through. And I'm glad I did, because basmati rice cooked with curry powder, ginger, and garlic topped with a creamy sauce of fish and tomatoes is something worth working for. Enlivened by some fresh cilantro, the fish and rice combo was a dish that you want to keep eating because it's both different and familiar. I guess that is what's great about these old-fashioned cross-culinary inventions. Take two familiar tastes and put them together and you'll get something new to be excited about. Of course, Kedgeree isn't new to those in the know, but it was new to me, and I think it makes an excellent lunch or dinner option. Although, for brunch I'm sticking with my pastries and bagels and lox. After all, I am only one-eighth British. Kedgeree Adapted from the Williams-Sonoma New England cookbook by Molly Stevens. You should feel free to vary the type of fish in this recipe for whatever is local to your area, and of course always check that it is a sustainable choice. Here's a link if you're not sure. In a heavy saucepan, heat the butter and 1 tablespoon of the olive oil. Add the onions and cook, stirring often, until softened. Takes about 10 minutes. Add the ginger, garlic, curry and cayenne and stir until the ginger and garlic are fragrant and softened, about 2 minutes. Add the rice and stir well to coat the grains. Add the water, and bring to a boil. Once it is boiling, give it a stir, lower the stove to low heat, and cover with a lid. Let the rice cook for about 20 minutes. Do not open the lid. Meanwhile prep the tomatoes and the fish. Take care to remove the fish bones before flaking it. Take a skillet and warm the remaining tablespoon of olive oil. Toss in scallion (if your using it) and the fish. Cook until heated through about 2 minutes. Add the tomatoes and the cream and stir to combine. Sauce should be a light pink. Let cook for 3 minutes and taste it. Add a bit more cream if the smoked fish flavor still needs mellowing out. To serve, fluff the cooked rice with a fork and put a big old scoop in a bowl. Top with fish and a bit of sauce and the chopped cilantro.